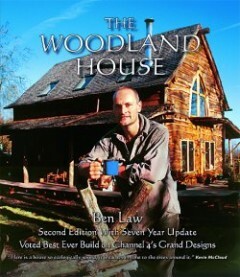 See full details of Eco Log House which used Onduline roof sheeting - the only manufactured product used on this award winning environmentally friendly house presented by Kevin McCloud for Channel 4 TV Series Grand Designs. Details on our products page under Onduline Roofing Systems. We are one of the largest importers and distributors of Bituminous Roof Shingles in Ireland along with the Onduline range of Roofing products which includes the new Onduvilla Tile Strips with its mediterranean bold roll profile which results in an exciting and exclusive roof covering that bestows an attractive aesthetic roof finish to any structure. We also supply tile effect metal profile roofing along with the new slate effect metal sheeting. 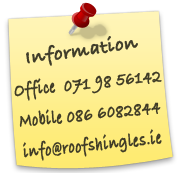 Most of our roofing products are in stock ready for next day delivery and we also offer a delivery service to any where on the island of Ireland. Bituminous and bituminous flexible shingles (Eurostandard EN 544) are manufactured from a material the base of which consists of glass-fibre felt, impregnated and covered with bitumen and modified bitumen bulk from both sides. The top layer of a flexible shingle is covered with crushed basalt that provides the colour and protects the bitumen from UV rays and mechanical damages. More that 60% of bottom layer of a flexible shingle is covered with adhesive, frost-resistant polymeric bitumen bulk protected with easy removable siliconised film.